The GIST team recently sponsored a showing of the movie Food, Inc. and this week held a lunchtime discussion of the movie, and of the book The Omnivore’s Dilemma, which we had invited people to read during the fall and winter. 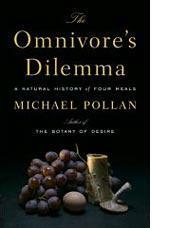 There is some common material between the book and the movie; Food, Inc. draws heavily from both The Ominvore’s Dilemma by Michael Pollan and Fast Food Nation, by Eric Schlosser. 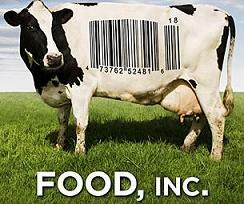 Now I’ll admit – when Food, Inc. first came out I thought “Wow. I do not want to see that.” But the more I thought about it, the more I realized that I wasn’t comfortable with my reaction. It’s one thing when the food industry expertly paints a bucolic façade so that I don’t know that there’s a disconnect between what they want me to believe (and what I want to believe) about the sources of my food and its actual production. But when I chose to look away when offered the chance to look behind the curtain, well then I became uncomfortable with my complicity. Still afraid to watch the movie (a fear that later turned out to be largely unfounded) I started with the book The Omnivore’s Dilemma and then worked up the courage to watch the movie. I learned a lot about things that I expected to learn about – organic versus conventional, confined animal feeding operations (CAFOs) – but even more about things that were totally unexpected. Things like the cause and effect relationship between the Farm Bill (which serves the food industry, not the farmers) and obesity, diabetes, and heart disease. And the quiet regulatory changes that have made it illegal in this country to conduct agriculture the way that it’s been conducted for the last 10,000 years. I will warn you that reading the book and watching the movie have changed the way that our household reads labels, where we get food, and what we get. For others, they may choose not to make any changes. Both the book and the movie do a good job of presenting information so that you can make an informed choice, but avoid being preachy about what that choice should be. If you missed the movie and would like to see it, it’s available on Netflix as a free “instant” movie that you can watch on your PC (at home please, or ITS will be after me for advocating excessive bandwidth usage!) The book is widely available from libraries as well as booksellers.